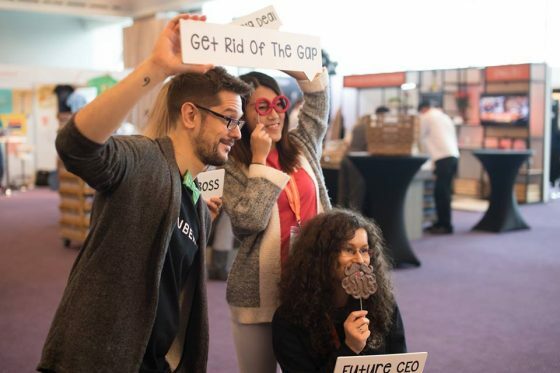 Earlier this month, over 1,000 women (and a few men) piled into the RAI exhibition centre in Amsterdam to take part in the specialist European Women In Tech conference. Esther O’Toole was among the delegates. It was just last week that ING economists forecast the Dutch technology sector will need to recruit a massive120,000 workers over the next 12 years if it is to maintain current growth trends. Between 20% and 25% of companies in the sector say staff shortages are now becoming a problem – a statistic making it even more crucial that ambitious women wake up to the opportunities that the technology sector presents. In Europe as a whole, around a third of science, technology, engineering and maths university graduates are female, although in the Netherlands the figure is nearer 25%. Nevertheless, the number of women holding high level jobs in the technology world remains noticeably low. The two-day European Women in Tech conference is a young event – this is just the second year it has been hosted in Amsterdam – but it was again completely sold out. Big brand exhibitors were there wooing potential programmers and managers: from Google giving CV clinics, to Unity demoing virtual reality. Brons studied AI and computer science at Utrecht University and says the variety of ideas her specialism covers as being one of the most attractive things about it. Now with Microsoft for six years, Brons works on ways AI can be used to improve daily life. Her favourite examples of the moment being the Microsoft’s Seeing AI app, which describes to the visually impaired what is in front of them; and an AI model being used in the staff canteen to monitor demand at meal times and so reduce food waste. Indeed, many delegates emphasised the wide range of opportunities that the tech world encompasses. Don’t be put off if you’re not a programmer, was a key message. Linden is now helping companies navigate some of the ethical issues tech is creating that society has not had to face before – situations such as the ‘personalisation-privacy paradox’. ‘We slowly get used to sharing more and more, and I wonder where it stops,’ she said in her keynote on day two of the conference. Coach Jess Ratcliffe was one of the many workshop leaders, helping participants work out what they want early on in their careers, and find ways to overcome the cultural issues that still hold women back in the workplace. ‘I’d say imposter syndrome is one of the biggest obstacles for many women,’ she told her audience. ‘We have a bigger tendency to attribute our success to outside factors, luck, circumstance,’ she said. For more information on this year’s speakers or 2018 early bird tickets check out the website.